Melancholy swept the nation on Thursday as news of Miriam Defensor Santiago's (MDS) apparent death broke out. Many Filipinos took to social media to express their sadness over the passing of one of the most revered Senators in history. MDS is known for her no-nonsense approach leadership which many Filipinos admire. She also made headlines for her witty banat that appealed to many Filipinos. 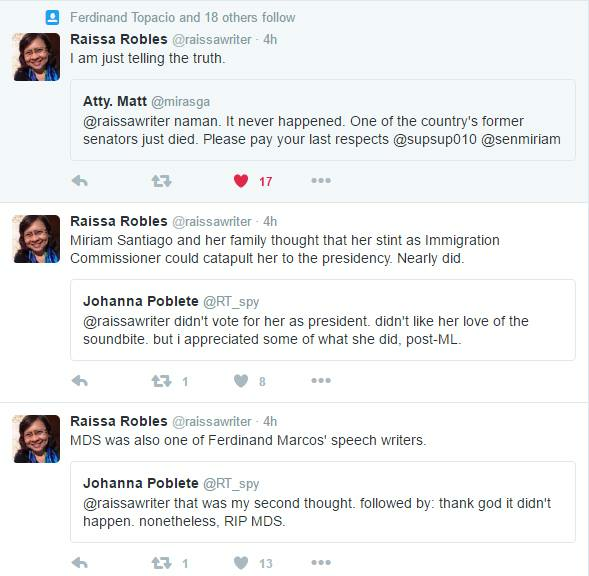 Despite of the sadness that everyone is feeling, one Filipino journalist took the limelight for tweeting distasteful remarks about MDS. 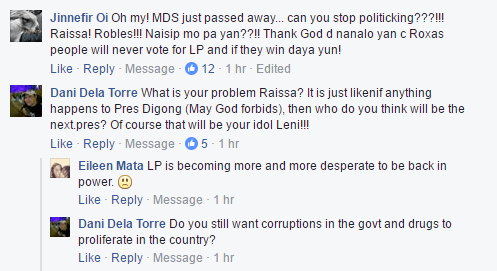 If MDS had become President and her VP had won, Bongbong Marcos would now be President.. Think about it. 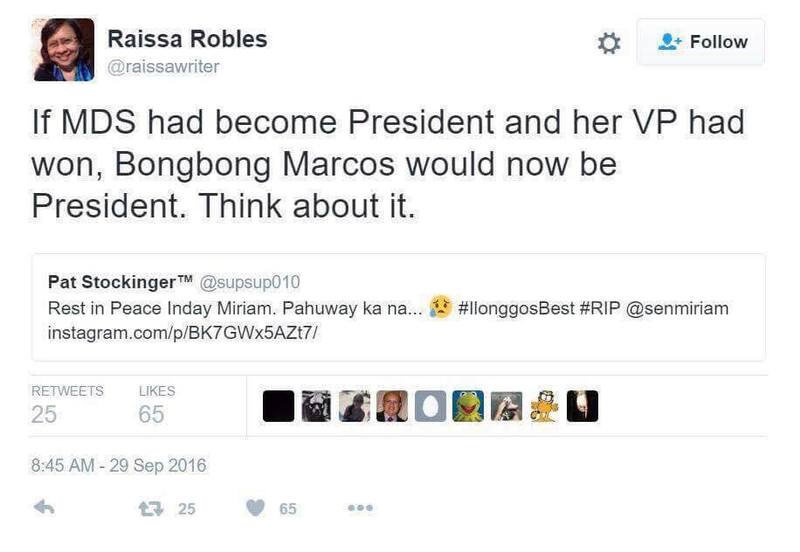 Many slammed Raissa Robles' action describing it as a deliberate attempt to advance her own political biases. The current administration's supporters perceive Robles as a Yellow or someone who is a rabid supporter of the Liberal Party, the party of losing Presidential candidate Mar Roxas. 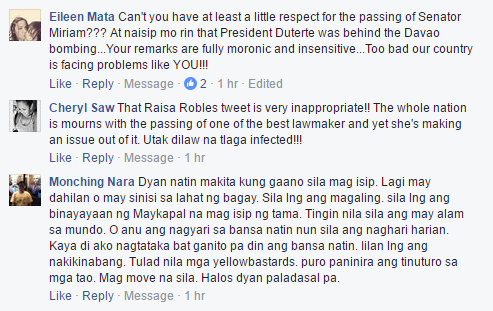 Many netizens directly called out Robles for her distasteful tweets, but she didn't budge and even went on to defend her words. 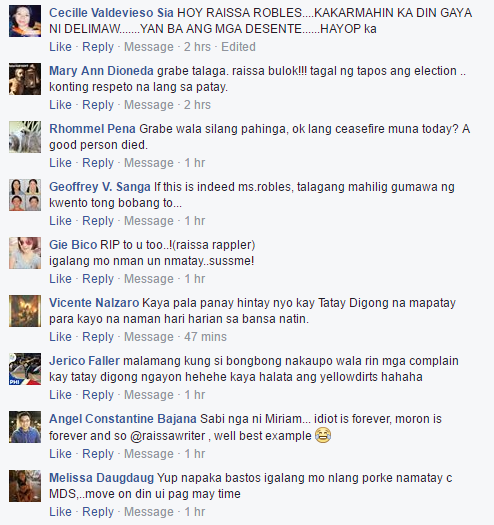 Screengrabs of the tweets were published in numerous pages on Facebook and attracted many reactions from Filipino netizens. 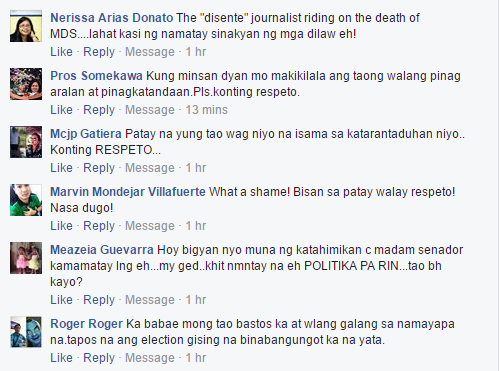 Below are some of the responses from netizens on Robles' tweets.